I can�t help it, I love classic yachts. But I love contemporary, retro style classic yachts, even more. 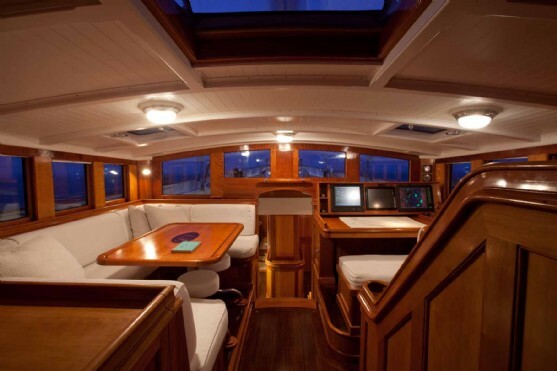 These yachts, while preserving the esthetic of another era, are able to take advantage of modern design, materials and building techniques that make for a lighter, stronger and better performing vessel than their ancestors. Recently I had the opportunity to inspect just such a yacht, �Carl Linn�. �Carl Linn� is a 32m sailing yacht designed by Gerard Dijkstra and built by Holland Jachtbouw in 2003. 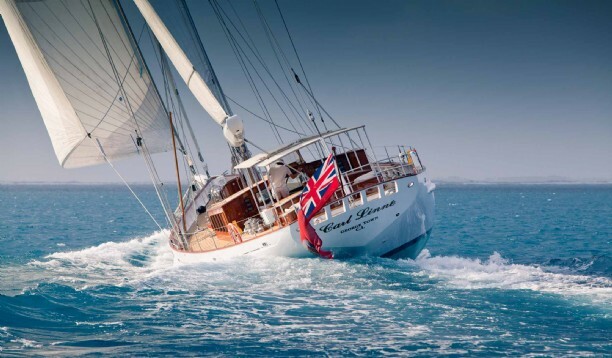 She was inspired by the Bristol Channel Pilot Cutter�s of the late 19th century. These designs are generally seen as the most successful fore and aft rigged boats built during the age of sail. The function of these boats was to ferry pilots to the ships carrying coal from port to port in the Bristol Channel, which is one of the most dangerous shipping lanes in the world.�Speed was of the essence, as the first pilot to reach a ship usually got the job and the nature of the currents necessitated a seakindly vessel. �Carl Linn� is by no means a Bristol Channel Pilot Cutter; far from it. But like these designs, she is a good example of a vessel whose design brief was focused on performance, rather than an interior design that then has a hull shape wrapped around it. She is a true bluewater performance cruiser, built to take the pounding. She carries a large, powerful sail plan, but has been setup to sail short handed. All sail handling lines are easily accessible from the cockpit area aft. The in-mast furling spar was designed with swept back spreaders which gives the rig enough stability so you can sail without the running backstays in up to 25 knots. 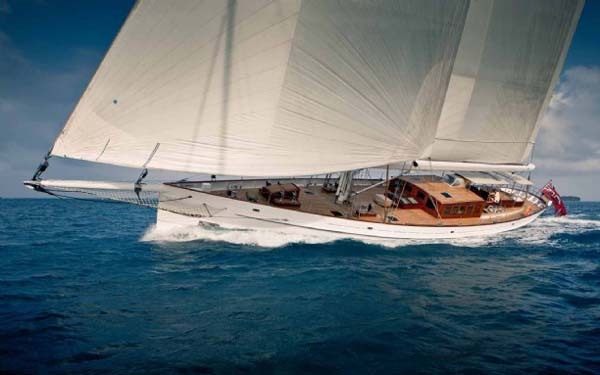 The staysail is self-tending and the Reckmann hydraulic furlers allow for infinite reefing so there is no need to go forward of the mast underway. In fact, in a blow, she can be sailed staysail/main and tacking becomes as easy as turning the wheel. The deck gear is impressive. All systems are hydraulic and there is beautiful stainless �jewelry� everywhere. The list of equipment for spars, rigging and sails reads like the who�s who of the best in yachting. 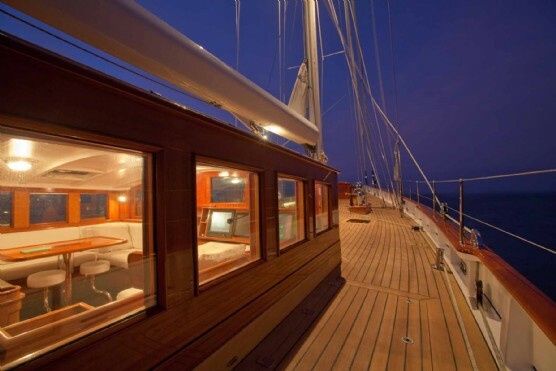 She has a flush deck forward with teak planking; beautifully executed. Amidships is the deckhouse with sailing cockpit which incorporates a drop leaf table. Just aft is an entertainment cockpit with dedicated access to the owner�s stateroom below. 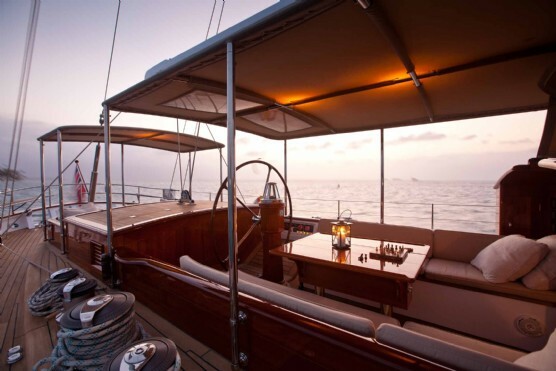 Forward of the deck house is a traditional teak butterfly hatch which is over the main saloon. 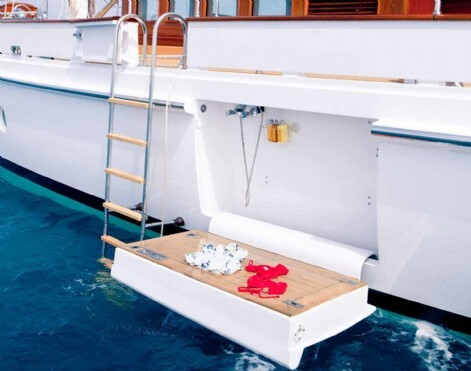 Access to crew quarters is through a deck hatch on the foredeck. Main access to below decks is through the companionway off the sailing cockpit. This entry takes you into the pilot house which has a nav station to starboard, seating to port and steps aft to the master cabin. Moving forward there are steps that access the main saloon and galley. The saloon is divided down the centerline by the casing for the lifting keel. A U-shaped dinette to starboard has seating for 8 with ample storage and access to the guest cabin forward which has two single berths and in-suite head. 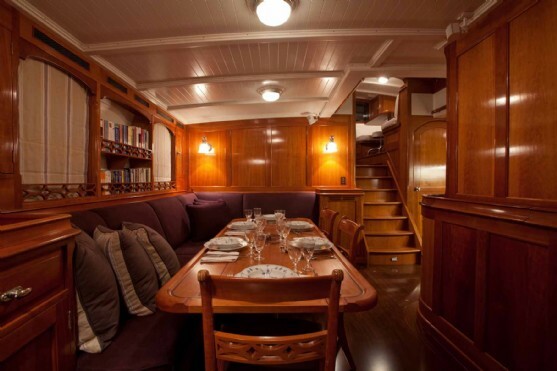 To port is a small dinette (breakfast nook) which is attached to a keyhole galley just forward. The galley is small for a yacht her size but has surprisingly good storage, is well protected and I am sure a pleasure to work in under sail. Next forward is access to the guest cabin on port. A Pullman double outboard with in-suite head. 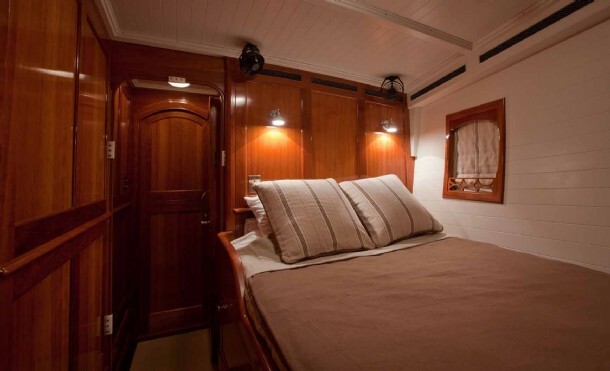 Access to crew�s quarters is through the port guest cabin. Crew quarters feature over/under berths to port, a double to starboard and a shared head in the forepeak. Below decks access to the crew quarters is not ideal for guest privacy but foredeck hatch access compensates to some degree. The full beam master stateroom aft is well separated for privacy and easily accessible from the pilothouse forward and the entertainment cockpit aft. 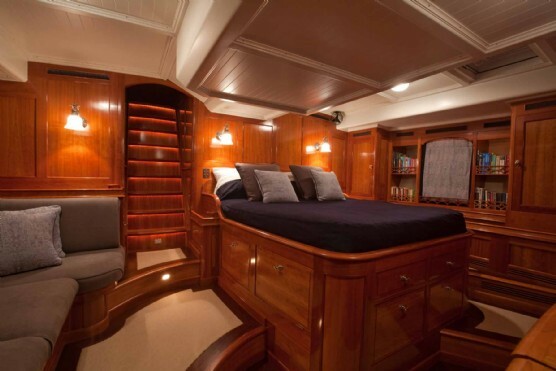 It has a queen size island berth offset to port with settee to starboard and a split head arrangement. Much needed when there isn�t room for his and hers. Engine room access is immediately to port upon entering the main saloon. An access door aft opens to a full beam compartment housing a Lugger 300hp diesel and ships machinery. The space is tight but workable. Would love to see more room here but then again; she is a sailboat. �Carl Linn� is a push button, globetrotter and she has done just that. Back from a two year expedition of the South Pacific she has had major maintenance work performed including a complete LPU paint job on her exterior. At the time I was aboard they had just finished all the brightwork on deck and it was impeccable. 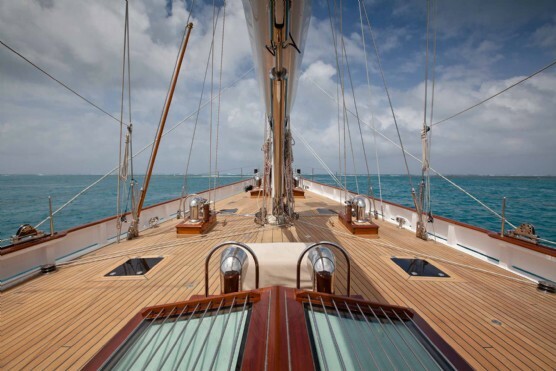 Over all �Carl Linn� is tremendously well built and displays excellent joinery work and exceptional sail handling gear. A modern classic combining traditional style with today�s technology. 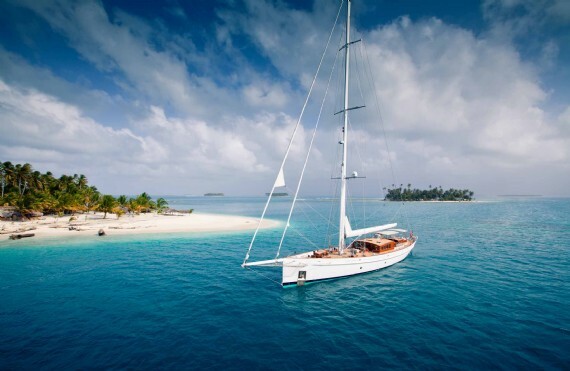 Of all the sailing yachts for sale on the market today, she is singularly unique. 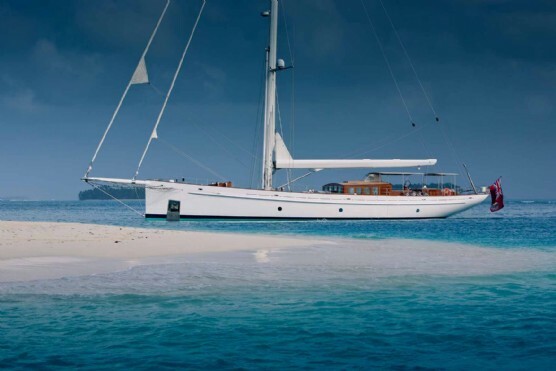 Please Contact Curt Stevens to discuss the full details on this solid world cruising sailing yacht.